Diabetics know all about blood sugar checks. 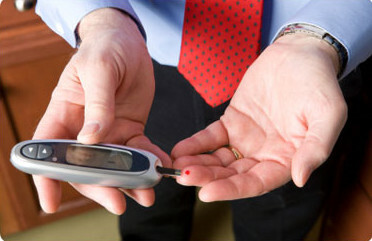 Many diabetics have to check their blood sugar several times daily, especially Type 1 diabetics. In recent years, a test has been introduced that can check the average of blood sugar levels over a few weeks or even months. The Hemoglobin A1c or HbA1c Test looks for glycated hemoglobin. This is produced when hemoglobin in the red blood cells pick up the glucose in the blood (glycated). The glucose hangs around for a while so when doctors measure this test, they can get a bigger picture of how you are doing with your diabetes treatment. The HbA1c is also referred to as the "A1c" and if the numbers with this test is higher than before, your treatment may need to be adjusted and you are at higher risk of long-term complications. Read on for more information about this test. An HbA1c test helps doctors see how well diabetes treatment plans are working for their patients. Doctors can also use it as a screening exam to check for diabetes. You may have also heard it called by the names: hemoglobin A1c, A1c or glycohemoglobin A1c. The doctor can look at this test and see what your blood sugar levels have average over the last few months. This is because hemoglobin in red blood cells pick up glucose and it tends to stay within the hemoglobin cells for a while. The higher the blood sugar/glucose level, the more glucose the hemoglobin absorbs. When this happens, the HbA1c reads high and the doctor will know that the blood sugar levels have been high over the last few months. How Is HbA1c Test Performed? Blood will be taken. The doctor will send you to the lab and they will take your blood from a vein. They have developed a home monitor for the A1c test, so your doctor may be able to prescribe a kit for your home.The home monitor uses a finger stick. No preparation necessary. Normally you would take blood sugar levels prior to meals (fasting) but this test does not require you to be fasting. You will feel a slight pinch. Whether the blood is drawn via finger stick or from a vein, you will feel a slight pinch when the needle goes in. There might be a little bruising and throbbing that resolves quickly. When & How Often Should You Take HbA1c Test? When you are first diagnosed with diabetes, the doctor will initially run your first HbA1c Test to see where you are at. The American Diabetes Association recommends, "If glucose levels are stable, then HbA1c testing can be done twice yearly." If your blood sugar levels are not stable it is recommended for your doctor to run the test quarterly until your levels stabilize. Using this test can help your doctor see if your current treatment plan is working or not. When the doctor works with the HbA1c numbers, research shows that the risk of long-term complications is drastically reduced. What Is a Normal Reading for HbA1c Test? What Are the Limitation of HbA1c Test? The HbA1c cannot help monitor daily blood sugar levels since they are an average of a few months. This also means that the test cannot monitor the fluctuations during the day and the differences from night to morning and vice-versa. There are some health conditions that can show false elevated HbA1c levels and this must be taken into consideration. These include kidney disease, alcoholism, high triglycerides in the blood. If you suffer from sickle cell, thalassemia or have blood loss your A1c may show lower numbers. In addition, the finger stick monitor used at home or in the doctor's may not accurately reflect the real circumstance While the finger stick version is very useful, any higher numbers are better off monitored in the lab until under better control. How Does the Body Control Blood Sugar Levels?